Reverse mortgages - SouthWind Mortgage, Inc.
Shopping for a mortgage loan? We'll be glad to discuss our many mortgage solutions! Give us a call at 561-791-8160. Want to get started? Apply Online Now. Reverse mortgages (also referred to as "home equity conversion loans") give older homeowners the ability to benefit from their built-up equity without selling their home. Deciding how you'd prefer to be paid: by a monthly payment, a line of credit, or a lump sum, you may take out a loan amount determined by your equity. Paying back your loan is not necessary until the time the borrower sells the home, moves (such as to a care facility) or passes away. You or your estate representative must repay the reverse mortgage loan, interest , and other finance fees at the time your property is sold, or you can no longer use it as your primary residence. Generally, reverse mortgages require you be at least sixty-two years of age, have a small or zero balance owed against the home and maintain the house as your main residence. Reverse mortgages can be advantageous for retired homeowners or those who are no longer working but need to add to their limited income. Social Security and Medicare benefits can not be affected; and the funds are not taxable. 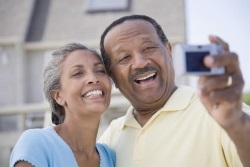 Reverse Mortgages can have adjustable or fixed interest rates. The lender cannot take away your property if you live past the loan term nor can you be required to sell your residence to pay off your loan even when the loan balance grows to exceed property value. If you would like to learn more about reverse mortgages, feel free to call us at 561-791-8160. Imagine living in your home without financial stress. Use the money however you wish. Own your home without making monthly mortgage payments and have a safety net for unexpected expenses or healthcare costs. Pay your monthly bills with ease and have enough extra cash to live comfortably and enjoy the occasional luxury. Take that long-awaited cruise or family vacation. Enjoy time hosting friends and family, participating in social engagements and pursuing your favorite hobbies. Choose a cash flow plan tailored for your needs. Interest rates can be fixed or adjustable. The money is tax-free* and does not interfere with most Social Security or Medicare benefits. A reverse mortgage becomes due and payable when the last surviving borrower sells the property, permanently leaves the home or passes away. SouthWind Mortgage, Inc. is approved to offer this government insured Home Equity Conversion Mortgage (HECM) reverse mortgage program, other government insured reverse mortgage programs in the state of Florida, and FHA/ VA Government Loans. Call us today for a free consultation to see if you qualify.